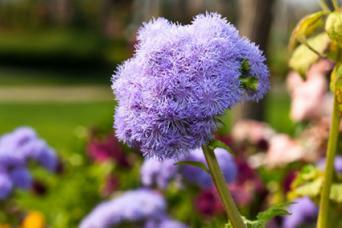 Ageratum, also known as floss flower, is an easy-to-grow summer annual with fluffy purple flowers. It is one of those special plants that will re-seed itself without becoming particularly invasive, making it a great choice for cottage gardens. The first thing to know about ageratum is that the named cultivars and the basic species each behave somewhat differently in the garden. The basic species - in other words, any ageratum seed packet that does not have a cultivar name - is the one that reseeds itself readily. It grows to about two feet tall. 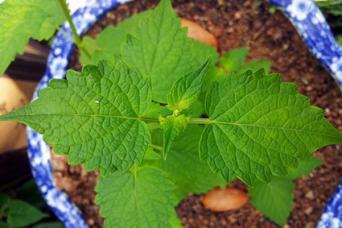 Ageratum leaves resemble mint leaves, though the flowers look like tiny asters, to which the plant is related. The basic species is best when scattered sporadically among other annuals and perennials in unstructured plantings. The named cultivars tend to be much shorter and compact plants than the two-foot basic species, and come in various shades of blue, purple, pink, and even white and red. The cultivars are also much less likely to seed themselves, which could be seen as a pro or a con, depending on how you want to use them. The low-growing cultivars are great for creating a mass of purple or blue in large flower beds. Ageratum grows equally well in full sun or partial shade and is one of a very few annual flowers that is capable of such flexibility. It does not require the richest garden soil, but is not a plant for poor rocky soils either. Good drainage is important, however. 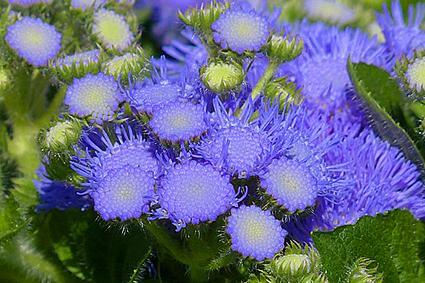 Ageratum grows quickly from seed planted in spring and will bloom all summer and until the first frost of fall. Its roots do not like to be transplanted, so it's best to sow it directly where it is to grow or use peat pots to give it an early start indoors. Peat pots decompose and can be planted directly without removing the plant. Sow seeds directly on the surface of the soil and do not cover them, as they need light to germinate. Ageratum can also be grown permanently in a pot, for which the shorter varieties are especially suited. 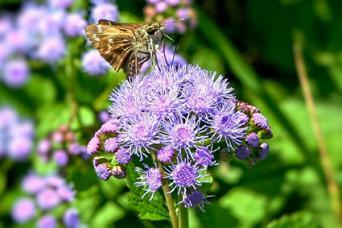 Ageratum requires very little care other than a modest amount of irrigation during dry spells. The flowers can be deadheaded, but it's generally not the best use of a gardener's time, as the spent blossoms all but disappear on their own and they tend to keep flowering without any encouragement. If anything, it's helpful to cut the tall varieties back about 25 percent in midsummer to keep them from getting too leggy. Ageratum is generally free of pests and disease. In humid climates, powdery mildew can be an issue toward the end of the growing season, but at that point it's better to just pull the plants out rather than trying to treat them. Purple and blue varieties abound and there are many shades of each available, along with a few more exotic forms. Blue Mink has light blue flowers on bushy and compact foot-tall plants. Hawaii is a mix of blue, white, and pink varieties. Blue Danube has electric blue flowers on dwarf plants just six or eight inches tall. Bavaria has white flowers with bright blue edges and grows about 12 inches tall. Ageratum is a favorite of butterflies and comes in a striking arrange of colors, making it surprising that it is not more commonly used. Its fast growth, long bloom period, and ability to self-sow make it indispensable for those that enjoy the cottage garden look.